I would say going from the bottom is a little easier. This time around we decided to ride the trail from the bottom. 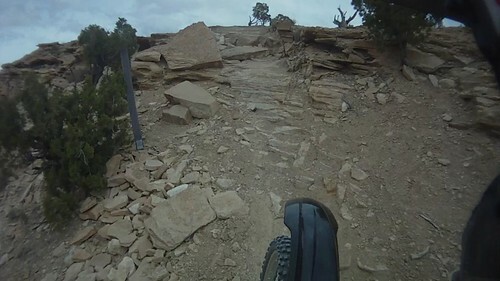 The trail starts in a gravel wash then climbs through a rocky section and up onto some smoother flowing single track on the top. The distance of the trail is around 12 and half miles but this doesn't include the miles on the road to complete the loop. We were camped near Temple Mountain and the total ride took around 2 hours with a couple breaks and a pretty leisure pace. This is a dirt bike only trail because of the width restrictions and it is enforced with a gate at each end. There are numerous sections that are only wide enough for a bike. This trail is short but with the colored trails nearby(Red, Orange, Blue etc.) and Five Miles of Hell, there is a lot of riding. There is also a fair amount of additional riding right in the Temple Mountain area in the form of atv trails, washes, and dirt roads. My boy and did this ride and it was awesome. I am glad we went from the bottom up, there was one section that would have been difficult coming from the top down. Thanks for sharing this info, it was very helpful.